Girl ditches LEGO juice bar kit instructions to build this mighty robot instead! Whether you think the pink and pretty LEGO Friend sets are an awesome idea or not, there's no denying that LEGO bricks, no matter the color, can be used to create all sorts of amazing structures. Case in point, the hyper cool LEGO robot-transformer character seen above, which was created using a LEGO Friends set designed to be a juice bar! 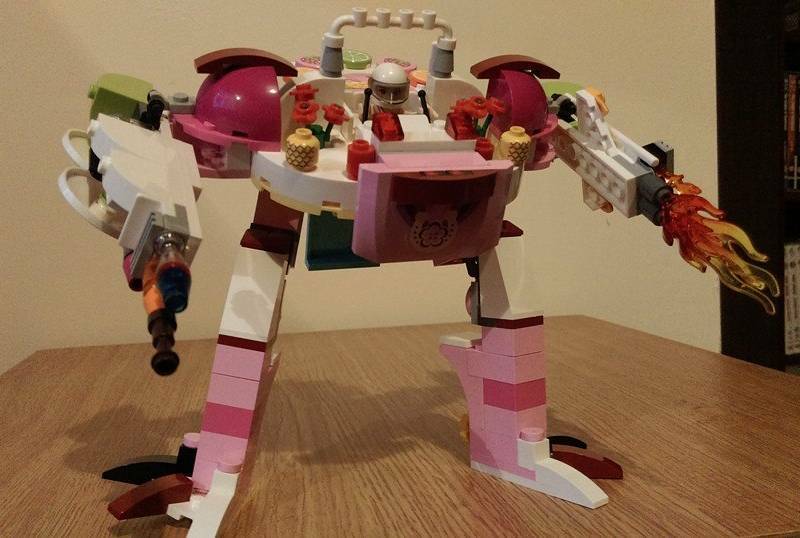 According to the poster of these Imgur images, the daughter of a friend received the LEGO Friends set for Christmas, but instead of following the enclosed instructions, she built a fire wielding robot minded creation. Some comments on Imgur note that it seems like an adult helped construct the creation, but even so, hopefully these images still demonstrate that young kids can build anything they'd like with their LEGO bricks and a little imagination -- and to always think outside the box! RELATED | Female Scientist LEGO Minifigs Come to Life Via Their Own Twitter Account!